I added John Wall, Bradley Beal, Otto Porter, Kelly Oubre and Dwight Howard to the trading block in hopes the computer would send some offers my way. Those are Kobe-esq numbers and we all know how bad those Lakers teams were towards the end of his career. Normally, I would not accept a trade offer from the computer that I felt was unfair or unrealistic, but the idea of this happening in real life was too enticing for me to decline. I accepted the Atlanta Hawks offer of John Collins and a first round pick for Bradley Beal. I wanted to see what Atlanta could do with Trae Young and Beal in the backcourt. Plus, I really like John Collins in real life and the Wizards have no future PF/C on the roster. ...I also accepted a trade offer from the Philadelphia 76ers. I got Jonah Bolden and the expiring contracts of J.J. Redick and Wilson Chandler and I sent Otto Porter and Jeff Green to Philly. I tried to gain a future 1st round draft pick to the deal and they counter offered by adding Dwight Howard. I quickly accepted. The Sixers now have a core four of Ben Simmons, Joel Embiid, Jimmy Butler and Otto Porter. The Sixers would go on to win the NBA Championship, defeating the Warriors in five games. Could this be the end of the Wall and Beal era in D.C.? Welp, that was fast. Now with John Wall, John Collins and Zion Williamson on the roster, I signed Klay Thompson and "completed my rebuild." I also signed Trevor Ariza, who will start for me at SF. Zion will come in off the bench to dominate opposing teams second units. Kevin Durant, Kawhi Leonard, Jimmy Butler and Kristaps Porzingis all re-signed with their current teams. Two months into the season, as we enter the year 2020, we had an 18-14 record. Wall (25) and Thompson (23) were scoring just shy of 50 points per game with Zion adding 19 off the bench. As a team, we rank 4th in points per game at 114, behind the Warriors, Blazers and Kings. We also lead the NBA in points off turnovers per game. By the All-Star Game, we had improved our record to 35-24, trailing the Southeast Division leaders, the Orlando Magic, by 1.5 games. We ranked 5th in the East. I simulated to April and with a 44-30 record, we had already clinched a playoff spot and were 2.5 games behind the Magic for the division title. Zion Williams won the Rookie of the Year award. John Collins missed three different stretches with minor injuries, leading to 23 starts for Zion. Luke Walton was named Coach of the Year as "his" Los Angeles Lakers won 56 games. Remember, they added Boogie Cousins to play with LeBron in the offseason. Even with Kyrie wearing a Clippers uniform, the Celtics won 48 games. Gordon Hayward led the team with just 18 points but Jayson Tatum and Jaylen Brown both averaged more than 15. A well balanced offense. Terry Rozier started all 82 games at PG. They were the 2nd best defensive team in the NBA behind the Sixers. Al Horford was injured so rookie Bol Bol was their starting center. Hayward (37) and Tatum (35) went OFF, combining for 72 points! We were held to 38% shooting as a team. John Wall did everything he could to keep us in this one with 32 points and five steals but in the end, it wasn't enough. As a team, we shot 7-35 (20%) from downtown and only attempted six free throws. Wall, Collins and Zion each dropped at least 20 points and we trailed by 10 after the first quarter. Both teams combined to shoot 27/85 (31.7%) from beyond the arc! Go figure, the defense limits Boston to just 22 fourth quarter points to even the series at 2-2. Wall dropped 29 with 10 assists and Zion recorded his fourth straight double-double - his second straight 20/10. Al Horford returned for Boston in this one. Boston scored at least 30 points in each quarter. Jaylen Brown led the Celtics with 29 points, Tatum and Hayward each added 25. Klay scored 32 points in a losing effort, a game in which we never led. Klay went off in the second half with 27 points, making all four 3pt attempts and five free throws. He finished with 32 points to force a game seven. Zion scored 22 points, Wall dropped 20, our largest lead was 21 points and we never trailed. 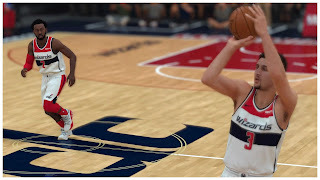 This game saw the Wizards down 15 at one point before a 39 point fourth quarter explosion to advance to the next round! John Wall scored 25 points, handed out 13 assists and we knocked down 20 of 25 attempts from the free throw line to knock off the Celtics in Boston. Despite 26 points and 22 rebounds from Zion, the Raptors limited us to 21 fourth quarter points and outscored us by seven to win by one point. Going 8 of 40 from deep didn't help. Kawhi Leonard and Kyle Lowry scored 60 points for Toronto. The Raptors scored 24 second chance points. Kawhi dropped 40 on us. Trevor Ariza was injured in Game 3 which moved Zion to the starting lineup. He scored 34 points and grabbed 12 rebounds. John Wall scored 32 and Klay added 23 points. Kawhi scored 27 points, grabbed 8 rebounds and had six assists and six steals - but shot 9-23. Toronto's defense proved to much for us as they held us to just 38% shooting and 10/38 from beyond the arc and forced 20 turnovers. LeBron James led the Los Angeles Lakers, down 3-1 to the Raptors, to a Game 7 victory and another NBA Championship. Clearly, things are going to go down very differently in the nation's capital, but they are going to have to get creative if they can't move John Wall's contract.